Considering that the official temperature outside right now is -5° (-30° if you factor in the wind chill) I could think of nothing more festive, or comforting than egg nog oatmeal. This was an experiment but I guessed that the creamy, rich flavor of egg nog would be a perfect accompaniment for oatmeal. I was right! Yum! I made the egg nog last night and stored it in an air tight container until I was ready to use it this morning. If you don't want to make it ahead you could just start cooking the oatmeal once the nog was completed. If you are heading out the door to do some last minute shopping, this should warm you up! For egg nog, in a small bowl add yolks and beat with a fork or electric mixer if you have one. Once beaten thoroughly mix in sugar and blend until sugar dissolves. Add egg mixture and milk to a medium sauce pan and cook over medium heat, stirring constantly until temperature reaches 160°, or coats the back of a spoon. Now stir in vanilla, cinnamon, and cloves. Either place in egg nog in an airtight container for use the next morning or proceed to the next step if you are ready to prepare the oatmeal. 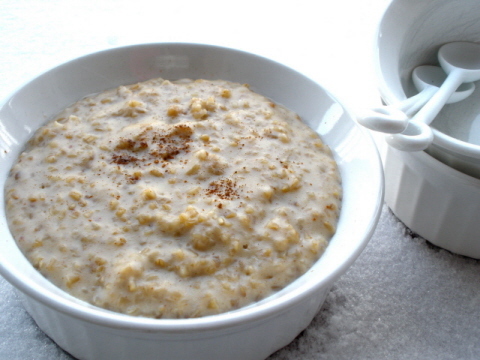 Bring egg nog to a boil, add oats and continue to cook until they begin to thicken, about 5 minutes. Reduce to low heat, simmer for approximately 25-30 minutes, and stir occasionally.